The Chief was introduced as Indian’s heavyweight competitor to Harley-Davidson and lasted for 31 years. In 1922, 21 years after the company began building bikes, Indian launched the Chief with a 61 cubic inch flathead V-twin, although a larger 74 cubic inch bike, called the Big Chief, was an option. The 61-inch Chef only lasted until 1928, when it was discontinued, but the 74-inch flathead engine remained until 1950. 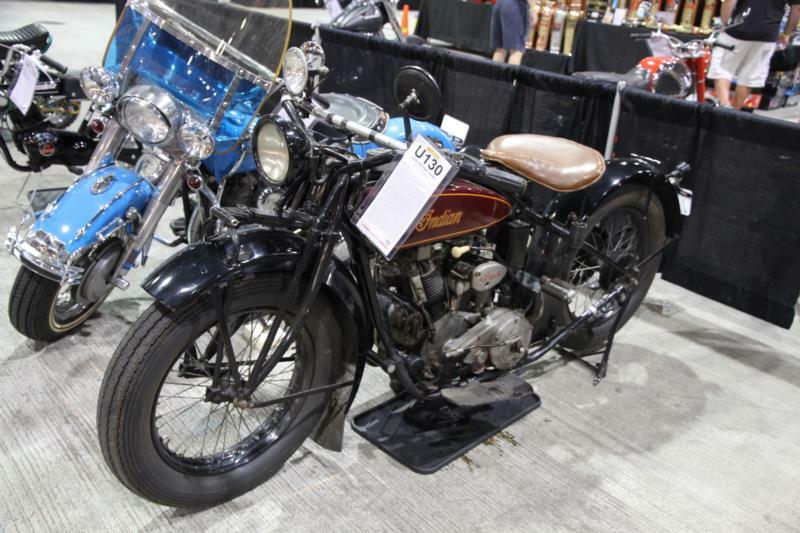 Indian remained faithful to the principle of a flathead, and in doing so escaped some of the pitfalls that Harley-Davidson encountered in their efforts with overhead valve designs. Aside from the engine, the Indian was actually rather unconventional, with its left-hand twist grip (apparently so that policemen would be able to use their pistols with their right hand), a foot clutch, hand shift and the ignition advance controlled by the right handlebar grip. A 3-speed gearbox was standard, but a 4-speed gearbox and a reverse gear were options. Before the Second World War, front suspension was by leaf spring, but in the postwar years this was changed to girder and coil springs. Rear suspension, meanwhile, went from an un-sprung hard-tail to a coil spring plunger. The Indian Chief benefitted from a range of spectacular paint colors after E. Paul DuPont took control of the company (after the merger of Indian with DuPont motors) in 1930, and these eye-grabbing paint finishes made for one of the most distinctive external features of Indian motorcycles. The instantly recognizable art-deco skirted fenders first appeared in 1940 and were accompanied by large leather saddles with a chrome plated grab rail for the passenger. After World War II, the Chief was the only Indian motorcycle to return to production. In the postwar years, the V-twin made 40 bhp and could propel the bike to 85 mph, but more aggressive cams, careful tuning and a magneto ignition made 100 mph a reality, and 35 mpg was possible. In 1950, telescopic front forks came out and the engine was stroked to its final 80 cubic inch size. At 550 lb, the Chief was no featherweight, but its mass was actually quite manageable until it came to stopping, when the tiny drum brakes proved unequal to the task. 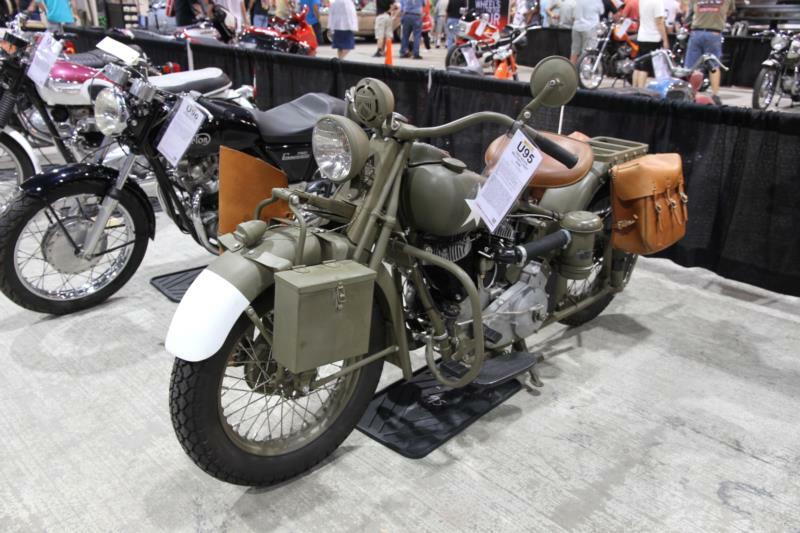 Postwar Chiefs also received a smoother siamese exhaust, and a new instrument panel and chrome Stewart Warner speedometer dominated the tank. Needle bearings in the front forks were replaced by bushings with grease fittings, and the frame crossmember behind the seat became a curved section of square tubing. An illuminated Indian chief’s head placed right atop the front fender became the bike’s most iconic feature. The postwar years saw Indian flounder with smaller twins that never got properly developed, but the Chief continued on as the company’s standard bearer until the very end of production in 1953. The Indian Chief is one of the few legendary American motorcycles that isn’t a Harley-Davidson, and these days sound examples of the Chief are much prized and many have been beautifully restored in the Easter egg colors for which they are best known. Once the rider gets used to the idiosyncrasies of the controls, the Chief is still a fast, elegant and even reliable way to travel America.